Six San Diego-area restaurants -- from a sushi spot and pizza place to a breakfast eatery, 1950-style diner, and a couple of delis -- have been named among the top 100 places in the U.S. to grab some grub. Yelp released its list of the "Top Places Eat in 2018" Tuesday and local restaurants claimed 6 percent of the rankings. Yoshino Japanese Deli, located at 2913 State St., is a daytime nook known for its poke bowls and sushi rolls. The eatery is open Monday through Saturday, from 10:30 a.m. to 1 p.m. and is closed Sundays. One Yelp reviewer called it a “cash only, get it while it lasts” kind of shop, so plan your visit accordingly. T Deli, located at 1469 University Ave., offers stacked sandwiches, wraps, homemade soups, salads and a wide selection of tea. The deli opens at 10 a.m., Tuesday through Sunday, and is closed Mondays. Yelp users praise the Chicken Pesto Torta and, judging by the photos, the sides of fresh fruit. 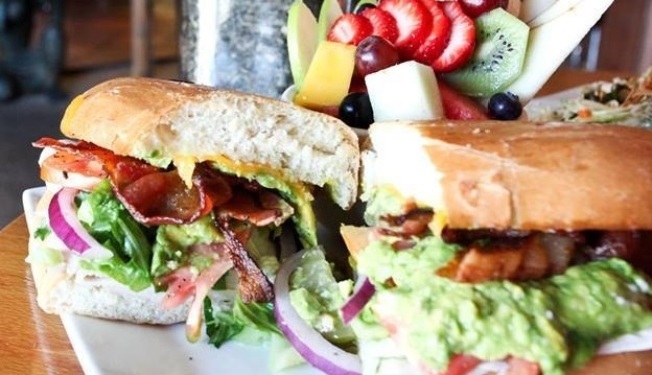 Sunny Side Kitchen – located at 155 S. Orange St., between Grand and Second avenues in downtown Escondido – is a mom-and-pop eatery that serves hot paninis, sandwiches, salads, soups, cookies, craft coffee. Last year, it nabbed the No. 51 spot on Yelp’s list of the Top 100 Places to Eat in the U.S. but this time, it climbed six spots higher. This breakfast spot is open Monday through Saturday, from 6:30 a.m. to 2:30 p.m.
Beyer Deli, located at 3065 Beyer Blvd. (Suite A105), is beloved for its sandwiches boasting meats like pastrami, corn beef and Philly steak. The tiny deli is open Monday through Friday, from 8 a.m. to 3 p.m. In Vista, Yelpers are crazy about Pizzamaniac, a homegrown spot located at 1461 N. Santa Fe Ave. The pizza shop, owned by a Vista native, is open daily from 11 a.m. to 9 p.m. The menu includes traditional pies, as well as gluten-free options, plus salads and fluffy garlic knots. The namesake “Maniac” pizza boasts pepperoni, ham, mushroom, onion and green pepper. Classics Malt Shop – located at 3615 Midway Dr., Suite B, in the Point Loma area – is a 1950s-themed diner that offers burgers, jumbo hot dogs, hand-scooped malts, milkshakes and old-fashioned favorites like root beer floats and Italian sodas. The eatery is open Monday through Saturday from 11 a.m. to 8 p.m., and closed Sundays. This cute, retro restaurant landed the No. 100 spot on this list last year; this time around, it climbed its way to No. 95. According to Yelp, the San Diego-area restaurants are in good company. Here's a peek at the eateries across the U.S. that earned the top 10 spots on the list. For a look at all 100 places, click here. Last year, two San Diego County restaurants made Yelp’s Top 100 list: Sunny Side Kitchen and Classics Malt Shop. The year before, eight local eateries made the cut, including Chula Vista’s beloved Tacos El Gordo. Editor's Note: Our original story named five local restaurants on this list, but there are six, including Classics Malt Shop. We apologize for that; congrats to all of the local, small businesses.